SVI has one specific business model: Be an integral part of upcoming space commerce opportunities. SVI is not a Venture Capital Fund for space companies, nor is it a financial institution (like a lender). SVI may offer services, or buy into, or be a match-maker; bringing individuals, companies or syndicates to form space companies that can plan and execute highly technical operations. SVI is based in Europe, is internationally focussed, and the people and companies that invest in SVI understand the overall strategy. Read our Investor Relations page to find our more about our Due Diligence requirements and regulatory oversight by the United Kingdom's Financial Conduct Authority. 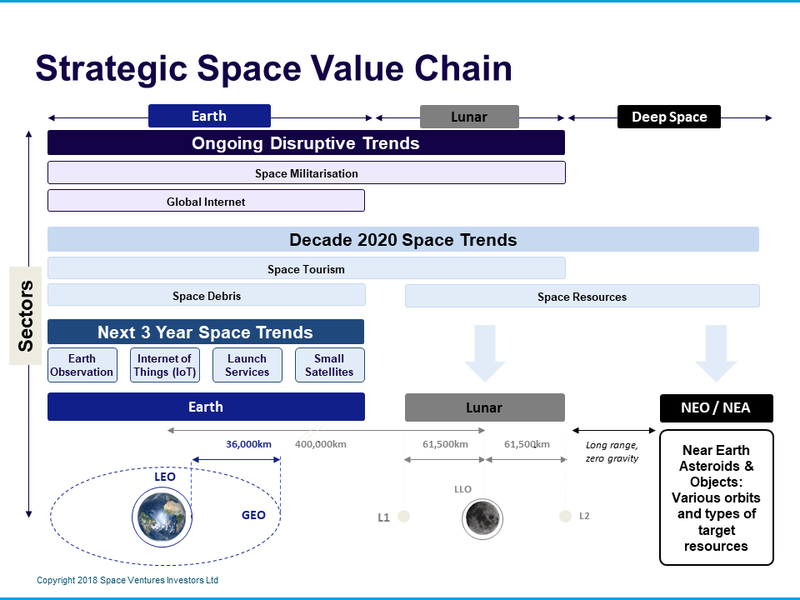 The Strategic Space Value Chain is any commercial space related business between earth and geo-synchronous orbit, focussed on low earth orbit and smaller satellites, and also includes long term commerical operations on the Moon and Near Earth Asteroids. Well established aerospace and space companies have the expertise, sometimes government funding, and proven technology, for billion dollar space infrastructure like launch services and communications satellites. While the goal of SVI is to be at that level in 10 years, currently the focus is on ambitious entrepreneurs and accessible technology that can open up space as a commercial market. Lunar Operatons; Detecting substances on the Moon, extraction, and return to Earth. Asteroid Mining: Detection and classificaitn of Near Earth Asteroids and Objects, probes, extraciton of material (e.g. water) and return to an Earth orbit. Sub-Orbital: Short horizontal lift-off trips, or ballooons. Orbiting Habitats: Commercial habitats for space tourism.